​Sunday, April 7, 12:15 PM – 3:30 PM, First Communion Class for young people in 4th grade and up who have not previously been been instructed in the meaning of Holy Communion. The class will begin with a pizza lunch, then continue with a 1.5 hour instructional session, and finally the youth will go to a local potterer to make their very own cup (chalice) which they will use at their first communion on Maundy Thursday, April 18, 6:15 PM. Led by Youth Minister Scot Redman, the Youth Ministry program at Christ Lutheran is a strong and vital part of our congregation. Weekly educational offerings, including Confirmation, Sunday Faith Formation and High School Bible study, allow our youth to build a firm foundation in the gospel of Jesus Christ. Contact Scot to learn more about our youth events and schedules. Confirmation is a Christian education program for our 5th-7th grade youth. In Confirmation classes, the youth learn about the elements of Luther's Small Catechism: The Lord's Prayer, The Apostle's Creed and the Ten Commandments. They also study the key principles and stories of the Old and New Testaments. Upon completing the three-year curriculum, the youth have several special projects, including a Confirmation Interview with the Pastor and their parents, a Confirmation essay, and making Confirmation banners to be displayed in the sanctuary on Confirmation Day. Finally, they are confirmed at Sunday worship, often on Pentecost Sunday. Confirmation classes meet on Wednesdays at 6 p.m. and Sundays at 10 AM. Our High School Youth (8th-12th graders) gather each Sunday afternoon at 5:00PM for dinner and a Bible study. They also use this time to unwind from a stressful week, engaging in activities such as paintball, laser tag, game night and lock-ins. Faith Milestones are occasions for our children to grow in faith with the support of family and our congregation. The Christian home is a place where faith is nurtured and passed on. The goal of Christ Lutheran Church, as a loving community of faith, is to support families' efforts to nurture faith in the home and as part of our church family. We mark Faith Milestones in the following way. The Milestones that we celebrate include the following: Introducing Jesus & the Bible, Prayer Pillows, Blessing of the Backpacks, The Lord's Prayer, The Ten Commandments, Noah's Ark, First Communion, Guardian Angels, Martin Luther 101, Confirmation, and Wrapped in Christ--Graduating Seniors. Our youth also grow in faith through mission work here at home and throughout the country. Whether they are planting a garden at an inner-city church, leading Vacation Bible School at an Indian Mission or handing out snacks and water to day laborers, the youth are learning how to live out their faith. 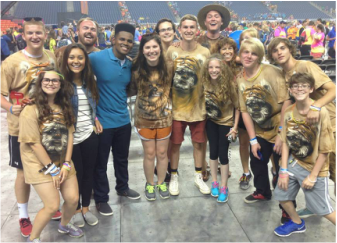 Every 4 years our high school youth group attend the ELCA National Youth Gathering and engage in outreach projects in the city during the convention alongside 30,000 Lutheran youth from across the country. In this unique approach, our High School youth reach out to the Confirmation youth to teach them about the youth program and how they can keep it thriving for years to come. Each year, our Jr. High Youth (6th-8th graders) go on a summer trip to enjoy fellowship, Bible study and outreach. Our High School Youth engage in two major outreach trips per year in addition to many shorter-term but still significant projects. Take Stock in Youth Missions! Congregation members have the unique opportunity to purchase shares of "stock" in the youth program. These funds help send the youth on mission trips and aid in other, local outreach efforts. Then in the fall, stockholders attend a special banquet in which the youth share their experiences in mission work in the last year.